If Alberto Ascari was dominating in Europe, at the Indianapolis 500 the early 1950s belonged to Bill Vukovich. 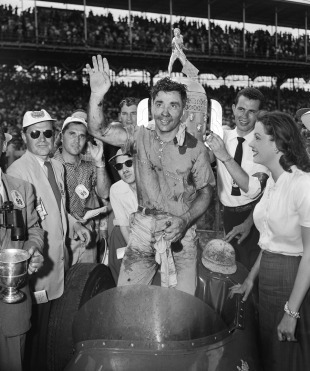 He led until crashing eight laps from the end in 1952, won in 1953 and 1954, and was killed while leading in 1955. At Indianapolis the conditions were gruelling, with the air temperature in the high 90s, causing the track temperature to reach 130 degrees. While most of the other competitors needed relief drivers because of the oppressive heat, Vukovich was one of the five to stay in his cockpit for the full 500 miles. A relaxed Vukovich took pole, led 195 of the 200 laps on his way to a victory achieved at an average speed of 128.74 mph. His astounding performance netted him $89,496. Vukovich charged into the lead, as was his custom. He didn't give it up until the 49th lap, when he went in for his first pit stop. In the next five laps, three different drivers took over the lead, but by the 54th lap, Vukovich was back in front. And he never looked back. The Mad Russian was an easy winner, finishing 3½ minutes ahead of runner-up Art Cross. The 195 laps Vukovich led was the second best for any Indy winner; only Billy Arnold in 1930, with 198 laps, was in front more. After Ascari's short-lived challenge in 1952, once again the field was entirely made up of American cars and drivers. It has to be said the decision to schedule the Dutch Grand Prix seven days later made it impossible for anyone to make the trip from Europe without missing out on that race. There was a sad footnote to the race when it was announced Carl Scarborough had died from heat exhaustion. He had retired when feeling unwell and died later at the infield hospital. He was the FIA World Championship's first fatality.